Directly convert video to MP4, AVI, MKV, MOV and other 1000 formats. Burn videos to DVD disk to play with your DVD player at 30X fastest speed. Convert 2D to 3D in MP4, MOV, MKV, AVI. Get below to see how to convert 2D to 3D MP4 in Windows (Windows 10 included). For Mac users, just get the tutorial here, How to Convert 2D to 3D MP4 on Mac. 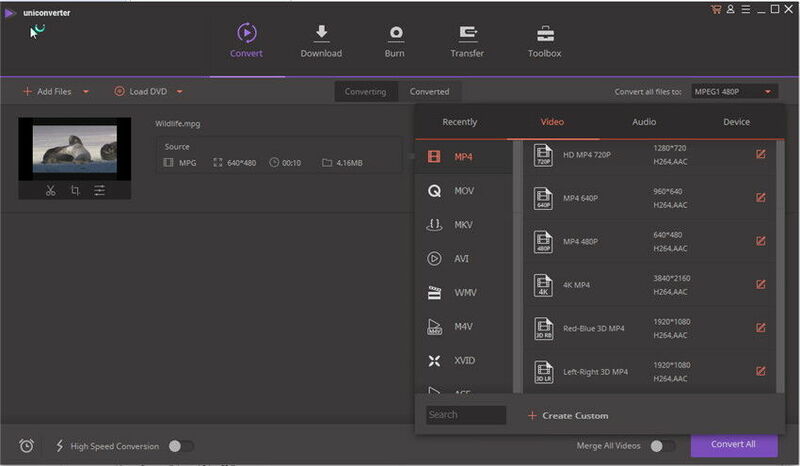 Directly drag your 2D common videos then drop to the 3D MP4 converter or click the Add Files menu to add video folders for locating the video files in the whole folder at one time. The program support batch conversion which enables you to convert several 2D videos to 3D MP4 files on the go. Since you need some 3D MP4 files, here you can select Red-Blue 3D MP4 if you happen to have Anaglyph red-cyan 3D glasses, no special device or software media player need; and choose Left-Right 3D MP4 if your 3D display uses Eclipse method or other 3D technologies. Click Convert and let the UniConverter (originally Wondershare Video Converter Ultimate) accomplish the rest automatically. Now, equip your 3D glasses and import these converted 3D MP4 files into your player and start your theatric 3D experience at home! BTW, you can also upload these files to your YouTube 3D page for sharing. Note: 1. To improve your media experience more amazing, the 2D to 3D MP4 converter additionally provides you some useful edit functions like cropping, add cool effects etc. To learn more about this, you can go to user guide of UniConverter (originally Wondershare Video Converter Ultimate). 2. Click the link to learn more about the differences between Anaglyph Red/Cyan 3D video and Side-by-Side 3D video.